The ultrastructure of human T and B leukemic cells is compared in this review. Both cells types can display smooth and villous surfaces, and nuclear pockets. B-cells generally contain more abundant rough endoplasmic reticulum (RER) than T-cells. On the other hand, pre-B-cells have as little RER as T-cells. Clustered dense granules, which exhibit lysosomal enzyme activities, seem to be a reliable ultrastructural marker of T-cells. Accumulation of glycogen particles is seen in T- but not in B-cells. Endoplasmic reticulum- or ribosome-related abnormalities, such as intracisternal accumulation of immunoglobulin, annulate lamellae, and a ribosome-latnella complex, are sometimes found in B-cells. 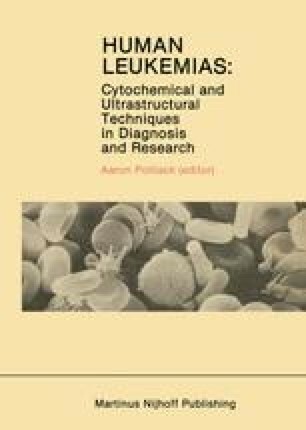 Ultrastructure of adult T-cell leukemia (ATL) generally conforms with that seen in other T-cell leukemias. It appears that nuclear irregularity and nuclear pocket formation are more prominent in ATL cells, than in other T-cell disorders.